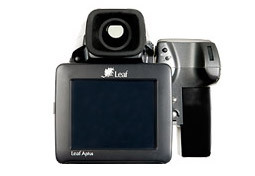 The Leaf Aptus 75s features a very high resolution medium format CCD with 33.28 Mpix and a 14-bit Analog/Digital (A/D) converter, and its pixel pitch is larger (7.2 µm) compared to those of the latest high-resolution DSLRs. With such a large area, photographers can expect the sensor to be very sensitive and with low noise. ISO Latitude ranges from 50 to 800—the largest range provided by any medium format camera currently in the dxomark.com database. With respect to their general use, the two most significant dxomark.com rankings for medium format are Color Depth and Dynamic Range. And both results for the Aptus 75s are impressive: a Color Depth score of 24.7 (average for 4 medium format cameras = 24.1) and Dynamic Range score of 12.5 (average = 12.4). Our measurements show that the ISO Sensitivity settings of the camera are real (that is, all ISO Sensitivity settings are obtained by applying a gain, analog or digital, before RAW delivery) for the entire ISO Latitude range of 50 to 800. As for (non-normalized) screen results, Color Depth (22.2) and Dynamic Range (11.43) remain good enough to allow for larger prints at high DPI. Despite the 75s’s excellent scores, it should be noted that this technology is now two years old, and results for the latest high-end DSLRs show an impressive increase in RAW image quality sensor performance (see overall ranking).